The Sens will have some help tonight with Erik Karlsson set to return to the line-up as they look to extend their 3-game winning streak. Karlsson has been sidelined since the end of the post-season after having a pair of of torn tendons in his left foot surgically repaired. We had a pretty detailed recap of his injury and recovery in this morning's Game Day 5 so if you're looking for more details on how we got to today be sure to give it a read. The captain spoke with the media this morning and provided some insight into his decision to play tonight after sitting out the first 5 games of the regular season. "I think that I'm at the point now where it's not really going to matter what I do. It's going to be what it is," said Karlsson about his ankle. "That's why I decided to play tonight. I probably could have waited and played later or I could have played sooner too." Karlsson admitted there might be some nerves tonight as he skates in his first game in a little over 4 months but hopes to keep things simple while he shakes off any rust. In regards to the rest of the line-up, Sens head coach Guy Boucher wasn't able to confirm his game roster as he was waiting to hear back about a defenceman who was a bit banged up from the road trip. With 12 forwards and 7 defencemen currently at his disposal, we find ourselves in another "11 & 7" or "12 & 6" situation. Something interesting from today's coach presser was Boucher analyzing the advantages of rolling with just 11 forwards and how that allows you to stray away from match-ups, particularly on the road. "Top players hate playing with 4 lines. They detest that," said Boucher during his game day media availability. "When you can ice a fourth line with Mark Stone on it...that's not a fourth line anymore. You put Kyle Turris on it...that's not a fourth line anymore. So it becomes very difficult for the opponent to match that." There weren't really any line rushes this morning but I jotted down the lines and pairings from yesterday's practice if you're into that kind of thing. Up front it's basically what we saw out west but the defence pairings are a bit jumbled with Karlsson in and Chabot back in Belleville. 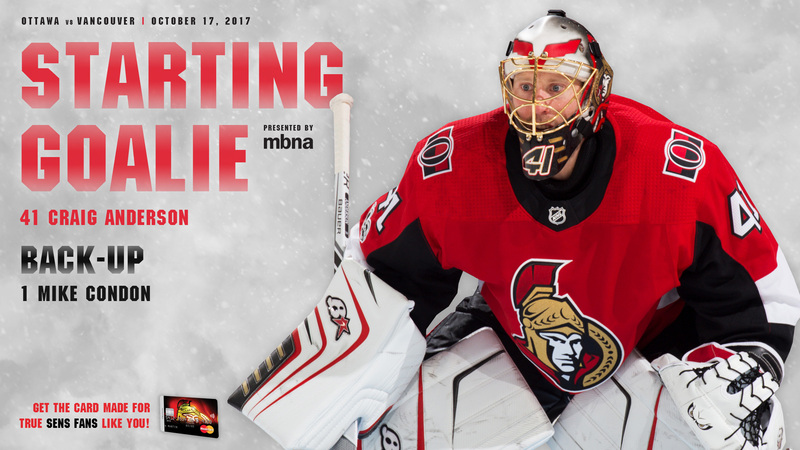 Craig Anderson (2-0-2) gets the nod in net for the Sens tonight as he hunts for his first win on home ice this season. Anderson recently bested these same Canucks in Vancouver exactly one week ago stopping 26 of 28 in regulation and overtime followed by 4 of 5 in the shootout. He followed up that effort with a solid 25-save shutout in Calgary this past Friday night.